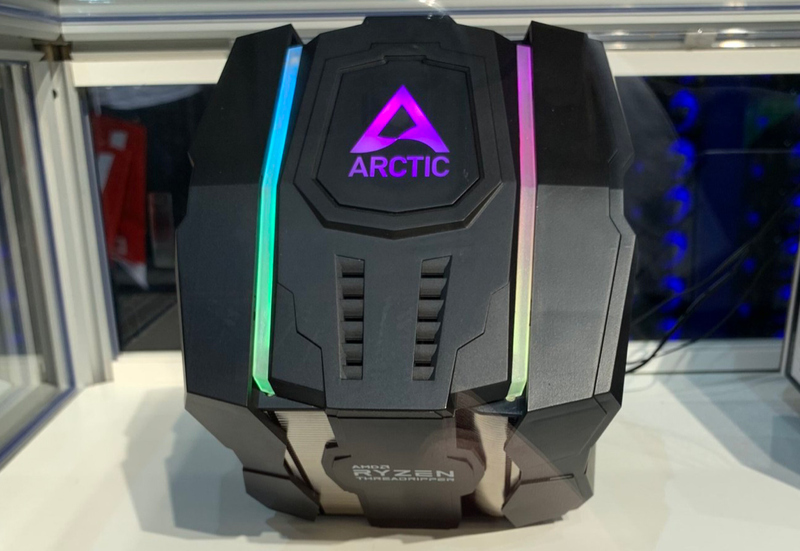 At an event for gamers in Leipzig, Germany, Arctic demonstrated a prototype of one the industry’s first partially-passive cooling systems for AMD’s Threadripper processors. 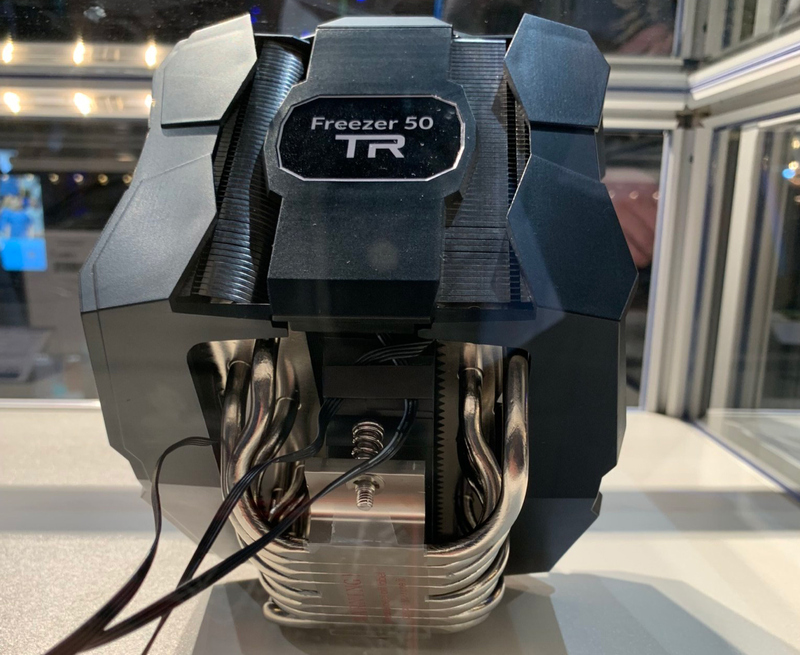 The Freezer 50 TR is a sizable heatsink-fan cooler that is specifically designed to be able to cool a Threadripper processor passively under low loads, allowing its fans to be turned off to minimize noise. And while it looks extremely big and will be an interesting challenge in fit in most modern PC cases, having cooler that can run noise-free under light loads certainly comes with its advantages. The construction of the Arctic Freezer 50 TR generally resembles that of other so-called “mega coolers”. The Arctic Freezer 50 TR is comprised of two massive aluminum radiators outfitted with eight thick heat pipes that are in direct contact with the processor’s IHS. The cooling system can be equipped with two (presumably 140-mm) fans that stop spinning when PWM signal drops below 5%. As an added bonus, the unit has adressable RGB LED bars. 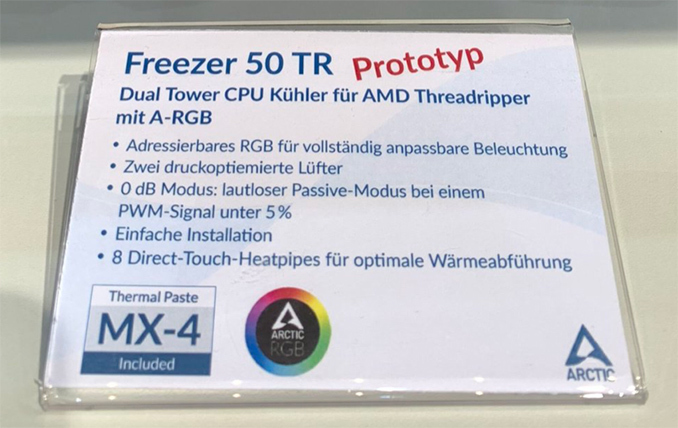 Arctic is not disclosing the TDP rating of its Freezer 50 TR cooler just yet (just like it does not disclose maximum rotation speed of its fans) as the product is still a prototype. Given that it's made especially for Threadripper, it's reasonable to to expect that it can dissipate more than 250 W, but the upper limit is unknown. For reference, there are air coolers capable of dissipating up to 340 W of power, but they are pretty rare. Since AMD’s Threadripper (as well as Intel Core i9/Xeon W-3175X) processors are aimed at extreme desktops and workstations and usually get overclocked by their owners, CPU makers often recommend using closed-loop liquid cooling systems with them to ensure consistent performance and longevity. Meanwhile since not everyone trusts LCS, many suppliers offer air coolers for “extreme” CPUs. Arctic did not disclose when it plans to release its Freezer 50 TR as well as its estimated price. Considering the fact that it usually takes months to finalize CPU coolers, it is possible that the product will be launched towards Computex trade show. Whether or not it will support next-gen processors is something that remains to be seen.